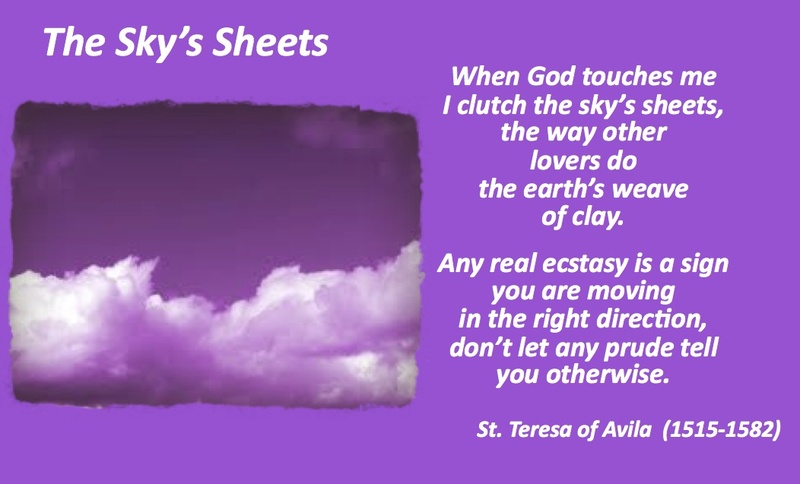 This entry was posted in Evolutionary Christianity, Progressive Theology, SERMONS and tagged evolutionary Christian sermon Lent 1A, Lutheran sermon Lent 1A, Lutheran sermon Matthew 4:1-11, Progressive Christian sermon Lent 1A, Progressive Christian sermon Matthew 4:1-11, Teresa of Avila by Rev. Dawn Hutchings. Bookmark the permalink. I must say that, more and more on Sunday afternoon, I wait for your sermon to be posted on your blog .I spent this Sunday morning at my Quaker Meetinghouse in silent worship, as I do every Sunday. After Hospitality I get back home have lunch and wait for your sermon to be available on my computer. It is always a treat ! Thank You. I am in the winter of my life and I know that death will come one of those days. I am not afraid of it. I don’t believe in paradise, or hell, or an afterlife. I’ll be 6 feet down in the Quaker Burial ground on Yonge Street. Next to me will be my graveyard “buddy”, the Anglican Archbishop of Toronto ( He is entitled to the Quaker burial ground because his wife is a Quaker . His in -Laws are already buried there. and his wife will be ). So I’ll be in good company. I am on the Interfaith Council and will be practicing Interfaith to the grave and after. To KNOW THAT WE DON’T KNOW is the beginning of wisdom they say. To accept NOT to know is difficult. Our species hates not knowing. We’ll create unbelievable stories to fill that vacuum. Not knowing fills us with anxiety and we are not good at handling anxiety as you know. I took the day off from work to be at your church Wednesday morning for the beginning of the series of lectures on Atheism. Although I am really looking forwards to lecture # 2 and 3. which seems to be more “intellectual ” than Bill Maher’s” entertainment” show made and produced for mass consumption.I think I’ve heard everything Dawkins ( and Sam Harris ) had to say I don’t totally disagree with them but don’t totally agree with them. A Richard Holloway is more in line with me. Anyway, looking towards March 12. Again Thank You for a great sermon.